I am reading How Children Succeed, by Paul Tough, thanks to blog reader Bill, who sent it to me by mail after he had finished it. His own review was (in part) that it was "a tough read... sort of like wading in mud," but that is often the way of non-fiction books that have a way of dancing around complex issues only slowly getting to the point which may have been obvious to some in the first place. I am not exactly sure what the word success means. In a successful society, one that takes advantage of diverse interests, diverse experience, diverse capabilities, multiple intelligences, diverse learning styles, complex cooperative and creative problem solving skills, to have a singular notion of what constitutes success misses the boat. In terms of the individual, to have something of significance to contribute to a culture the future of which is actually an unknown, is a difficult thing to prepare for. In any case, those looking for a simple formula to guarantee success in their kids won't find it in this book. Success is a hard to define term. It's relative to what goals might be, and just as success is difficult to define, finding it, whatever it might be is not a path devoid of hard work, and attempting to offer it to one's own children requires a great deal of attention to skilled and tactful parenting. How Children Succeed does make the point that schools and parents have missed the boat by thinking that success is mostly a matter of intelligence rather than character and grit. Success in meaningful things is always a matter of hard work, and often difficult parenting. (Not that that isn't a joy). In the meantime Tiger Mothers with their fear that their children will fail at anything, get behind and keep shoving. There have been a number of illuminating books on the idea of child success. The story of the Tiger Mother was one. Malcolm Gladwell's book the Outliers, another. This book too, seems so far in my reading to add some interesting insight to the mix. Yesterday I talked with a good friend John about our kids, his son, my daughter. John's son Michael now works as assistant to the Provost at a Texas university, has his law degree and two master's degrees and is beginning work on a PhD in economics. Michael appears at at this point to be headed toward becoming academic leader of a university, and so we were talking about the parenting skills that apply to that level of "success." Where children are given unconditional love, by parents who are themselves concerned with important issues and full participation in life, those parents give their children a leg up by example. Where some degree of rigorous engagement is also an expected requirement, with insistence that children meet their assigned responsibilities appropriate to their age, children are given tools of character that will lead them to greater success. PS, Thanks Bill, for the book! I'll pass it along when my reading is complete. When my father returned from WWII, he had spent a huge amount of time in combat with the 110th infantry division, the Timberwolves. He was not in Europe for D-Day. In fact the ships carrying his division were the first to actually land and unload at a dock having gone direct from New York to France. But missing the Normandy invasion did in no way leave my father out of the action. For a time he was with the Red Ball Express running supplies to Patton’s rapidly advancing army. His next assignment was to fight through the lowlands of Holland, through dikes and marshes into Germany. The Timberwolves were trained as specialists in night combat. During the Battle of the Bulge, my father and his dividion were right at the edge, holding a defensive position as the Germans swept through into France. When spring came they picked up stakes and pounded their way through Germany. Dad was among the first to cross the bridge at Remagen, and with his division liberated the concentration camp at Nordhausen. At the end of it all, my father was sick of two things (besides seeing so much death and destruction): Sleeping on the hard ground, and guns. He did not want to go camping and refused to have a gun in the house. The pearl handled Colt that my grandfather had given him to carry in a shoulder holster during the war was given away to get it out of the house. As a young man getting my first BB gun, my father warned me, “do not point that at anything you do not want to kill.” And so I learned that guns, even as harmless as BB guns were to be taken seriously. And it irks me that there are so many who take them as a joke, or believe they can be taken lightly. In Omaha, Nebraska, for a time as I was growing up, my Dad was the manager of a hardware store which was also the largest gun store in the region. The stories about the foolishness of gun owners as they brought loaded guns into the store, pointing and joking and having forgotten they were loaded went on and on. There was no end to it, and seeing how callous gun owners were irked my father who had seen so much death at the working end of a gun. Folks, mainly men, would stand at the gun counter, taking aim with rifles and pistols down the aisle of the store, and my father would turn to discover himself in their sites, just as he had known himself to be in the sites of snipers in WWII and ready to be killed in less than an instant. I would not be troubled by firearms in the US, if I knew each father was one like mine. They are not. Children die from playing with their father’s guns. Young men and women buy guns without ever seeing the seriousness and caution that should be a pre-existing foundation for ownership of dangerous weapons. The costs of this imbalance are enormous. For each Newtown, each Aurora, each Columbine, there are hundreds of additional, smaller incidences of gun violence each week. This said, I will allow comments if they actually address how we can have a society that tolerates guns and provides for the more absolute safety of kids. With the deaths in Newtown and the more regular incidences of gun violence in which children are affected in cities and towns across America, more must be done. Did I suffer as a result of my father not allowing dangerous guns in the house. No. He bought me a ShopSmith for my 14th birthday. Before that time as I was growing up I was constantly involved with saws, hammers and the like, fixing and making with Dad. Folks think that guns are the manly wonderful thing to do with your kids. I would like folks to know that there is another direction that gives so much more. "[Leonardo]... took an artist's vision into science. He understood that science, as much as painting, has to find the design of nature in her detail... he gave science what is most needed, the artist's sense, that the detail of nature is significant. Until science had this sense, no one could care--or could think that it mattered--how fast two unequal masses fall and whether the orbits of planets are accurately circles or ellipses." As an example of how visual understanding can shape ideas and help to illuminate ideals, the map above shows the per-capita gun deaths by state in 2007. Sadly, my state of Arkansas is clearly in the red, though not as deep red as neighboring Louisiana. 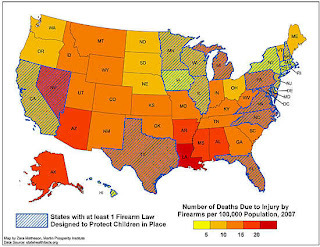 The diagonal lines across individual state maps identify states that have enacted at least one piece of legislation to protect children from guns. At this point, it would be interesting to learn whether those states with highest NRA membership benefit by having lower gun deaths, and more legislation put in place to protect kids. With 16.3 gun deaths per 100,000 in population, you are 5 times more likely to die of gunfire in Arkansas than in Massachusetts. It is ironic that parents would be frightened of woodworking tools, and then keep guns in their homes. The logic is similar to that of putting caps on all the electrical outlets in your home and then texting and driving while your baby is strapped in the car seat beside you. This interactive map shows the proliferation of hand guns in just two counties in New York. In the meantime, the argument between those who think guns make us safe, and those who vehemently disagree can go on and on without resolution. 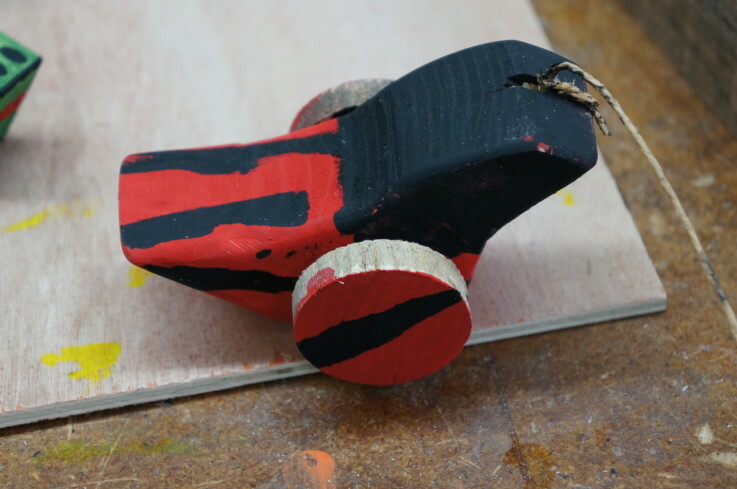 What I hope folks might find agreement on is the notion that by children and adults being engaged in creative acts, using tools that have more clearly defined creative purposes, would be more mentally healthy, more wealthy and more certainly wise. That is for me a no-brainer. If anyone wants to contribute to that discussion, I will welcome your observations. I have been working on my book proposal, extracting extraneous text, eliminating ambiguity, and clarifying my points, and today I will return to the wood shop and make boxes. 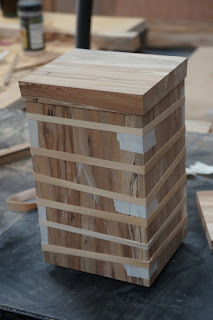 Marc Adams School of Woodworking has sent out its Summer 2013 Catalog, and I would like to warn readers that if you want to join my box making class June 10-14, you would want to consider registering now. 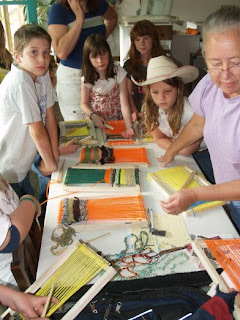 The class is often full and registering early will guarantee your spot in the class. An article from NPR and suggested by Randall describes how some parents in Oakland, CA, are taking the needs for their kids to make into their own hands. 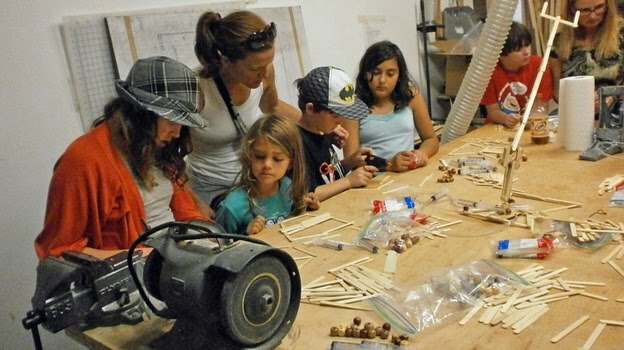 With Growth Of 'Hacker Scouting,' More Kids Learn To Tinker And why not? Children who are engaged in making real things are often too busy for more senseless and destructive inclinations. Also check out DIY.org This is your last making day before Christmas. Make the best of it. 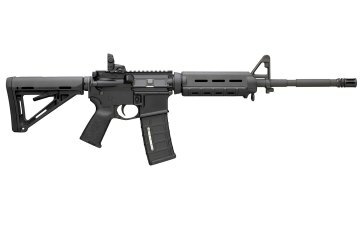 Wayne LaPierre, Director of the NRA explained on Meet the Press this morning, that the Bushmaster AR-15 was just a tool. In case you do not know the difference between one kind of tool and another, please take the quiz at right. I'll give you a full week to get the right answer. 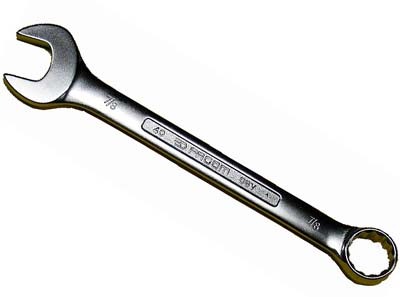 Is one tool just like any other? R. Francis, in a comment below suggested an article in the New Yorker, The dark presence of guns. Another good place to read is Geoffrey Canada's book, Fist, Stick, Knife, Gun. 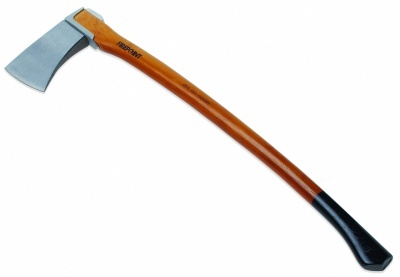 Tools have ways of shaping their users, bringing change both the material and craftsman. This was noticed by Comenius, the father of modern pedagogy, and utilized in his pedagogy of crafts education, so this is not just a senseless argument to be making in this blog, but one directly to the point. We train our children to become either creative, or to align with darkness. Otto Salomon said, in the Theory of Educational Sloyd that "To teach with educational tact" is a principle to which "we attach great importance." He said, "Educational tact is an attribute of every real teacher, but one exceedingly difficult to define, and it has been said that, since it is incapable of definition, therefore it does not exist." He states further, "This tact is partly a natural gift, partly derived from experience, and partly the result of sympathy." In other words, he was describing teaching as an art in which the teacher is attuned to the speicific needs of each child. Tact according to the dictionary means "adroitness and sensitivity in dealing with others or with difficult issues." In other words, art. I have been thinking of the thrust of modern education in which the greatest part of the teaching responsibility is being gradually shifted from the teacher to the mechanized device. Arthur Clark had said that "Any teacher that can be replaced by a machine should be!" So does that mean that the teacher of the future will become more like the self-checkout help at the big box store? 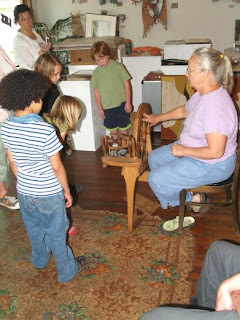 Or will the teacher persist in his or her traditional role of keeping students artfully engaged in learning? Perhaps an answer will be found in Salomon's next principle of educational Sloyd, "to teach through the senses, especially touch and sight." Interestingly, tact and tactile are from the same Latin root tactus "touch, feeling, handling, sense of touch," from root of tangere "to touch" (see tangent). Meaning "sense of "discernment, diplomacy, etc." first recorded 1804, from a sense that developed in French cognate tact. "a means through which the pupil derives great advantage from the constant use of his faculties of observation and perception, through both sight and touch. This he cannot do so well when he sits a passive and patient listener to the dogmatic instruction of the teacher." We will get better schools when we untie teacher's hands, and thence hold them to the highest standards. That of expressing tact. "this is different from a gun..."
"This is different from a gun," was what a young man in Venezuela observed when given his first clarinet. It changed his life. The power to create beautiful music is one of those things that can differentiate successful kids from those who may become a burden to society. There is a transforming effect on the individual when he or she aligns with his or her own creative capacity. And yes, young man, there is a difference between tools for creativity and those intended only for violence. 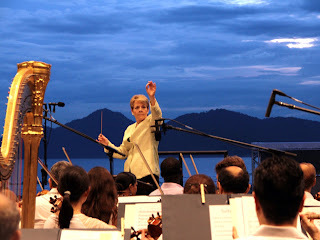 This morning an NPR Weekend Edition article told the story of Marin Alsop: A Utopian Musical Dream From South America and her youth symphony orchestra. Music has the power to transform young lives. Please listen to the story. "Recently, the Brazilian government declared music to be mandatory in elementary and secondary school, and officials are currently creating teacher training programs to serve all children." Yesterday, and in very stark contrast, the NRA proposed that we have guns and armed guards in all our nation's schools. Surely that will play on folks fears and make them buy more and more guns. It would be far more transforming and less costly to have greater access to music. And let's not forget wood shop. 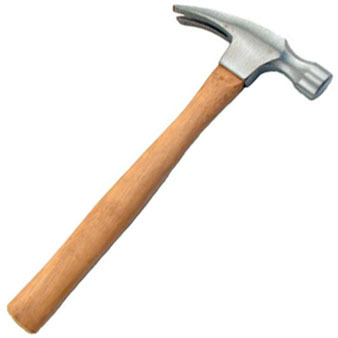 Tools give shape to thought. Our use of tools gives sense of self. And so is it any mystery that those hands which hold guns would see the rest of us as irrational and vice-versa? "Written with a philosopher’s intellect and a poet’s grace, The Lost Carving carries the reader ever deeper into the marvel of creation, exploring the connection between creativity and physical work and telling the story of the passionate pursuit of a vocation that unites head and hand and heart." 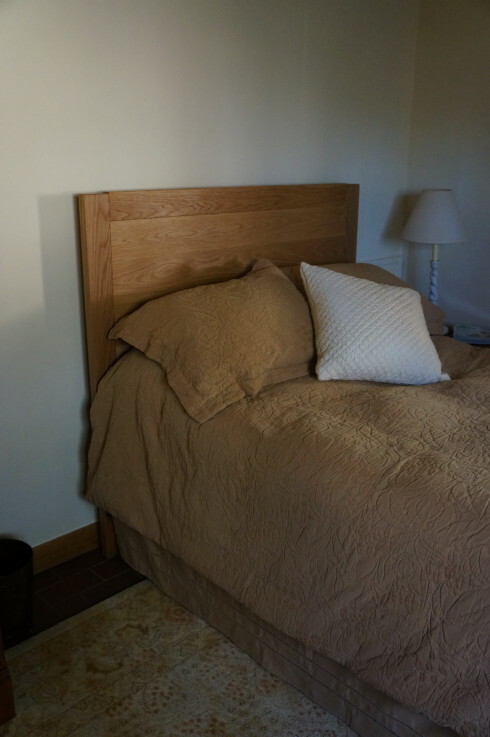 Simple white oak headboard now on bed!! Readers will note that I added a translation function at the top right, making things easier for those reading in other languages, and the simple white oak headboard is complete. If you're reading this in the morning, and you're not dead yet, it has nothing to do with the Mayans and the Mayan calendar. It has to do with the relentless quality of real life. Our planet is millions of years old. And it will be around for a while longer even though we seem to making a pretty big mess of things. 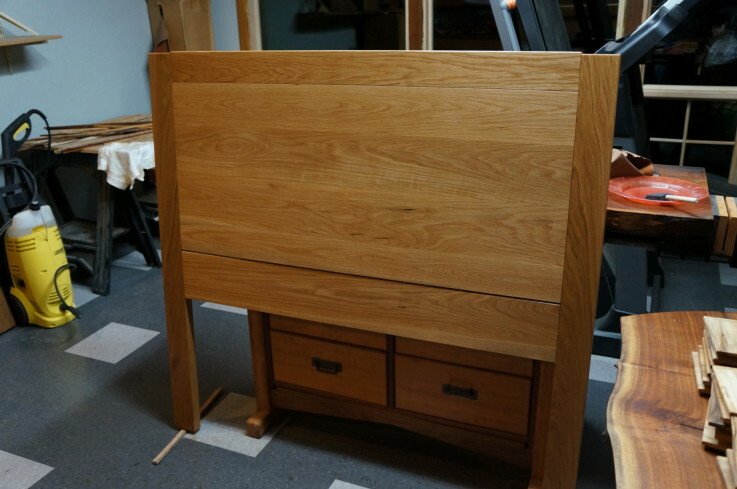 In the meantime, I'm ready for the second coat of Danish oil on the headboard I've been making, and I'm preparing to start making my usual small boxes that will be needed to fill orders in the spring. I am also trying to get my book proposal finalized, for the title, Hands-on, Hearts-engaged, about the strategic engagement of the hands in learning. One would think that folks would notice on their own, the integral relationship between the hands, the senses and mind in learning. But we've been conditioned to regard intellect as residing outside our own experience. We find it in books, experts armed with instruments, the internet and statistics and are taught to question our own capacities to evaluate what we see, hear, and do. The danger, of course is that we thence stop taking the time to watch and learn, and become passive in the face of real danger. On the gun thing, I had noticed early in my life that guns were a poor substitute for actual manliness, and I wish more would be said on that point in the current controversy. Sarah Palin applauds herself for her manliness, and in truth, to have the finger on the trigger gives a sense of power... that of knowing you can kill. But to need those feelings says a great deal of ugly stuff about one's sense of self. 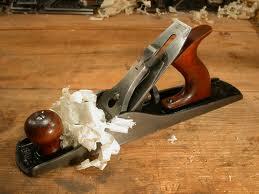 Having your hands on a plane can also convey a sense of manliness, but when you use it wood gets smooth to the touch. That's much better than something or someone being dead. We are now down to about 4 making days before Christmas... One cannot make beautiful and useful objects without returning to our traditional human roots as observers of physical reality. Update... It is now Dec. 21, and unless I've shifted to a parallel universe, I'm still alive and the nincompoops who predicted the end of the world (it wasn't the Mayans, they just ran out of paper), are proved wrong, as has happened so many times before. (Do you think this was all a plot to sell more flashlight batteries and guns? ) In any case, the headboard is now finished but for installing to the bed frame, and I'm going back to other projects. John C. in a comment below tells that he has guns for defense of his family and relays a story from Oklahoma about a young mother forced to kill an intruder. I have to admit that there are times when guns have actually come in handy for self-defense. And each and every day in America, there are hundreds of incidences of more senseless gun violence. Admittedly it is a complex problem involving mental health, poverty, fear, and self-image regarding masculinity and power. We fail in schools to teach children creative problem solving, both with regard to the materiality of the planet, and in terms of interpersonal relationships. I do not advocate the complete removal of guns from our society. I just think there should be some balance in our approach. The NRA has promised to come up with something today(Friday, Dec. 21, 2012). Perhaps they were waiting this very long week to see if the Mayan end of the world would come first and take them off the hook. In any case, my hope is that we can solve the problem of gun violence and get back to making beautiful and useful things from wood. Update 2. It took over a week to come up with this... Wayne LaPierre and the NRA propose that every school be equipped with a cop and guns. The government is supposed to pay for it. They said that they had been quiet this last week out of respect for the victims. BS. Given all this time, with senseless gun violence happening every day, they could have come up with something that actually advanced American culture. Do reasonable folks really believe that our schools must become armed encampments in order for our children to be safe? Will these police officers on duty be equipped with bullet proof vests, semi-automatic weaponry, and cop killer bullets like those in fashion with gun nuts? I have rarely heard anything more stupid in my life. Columbine High School had an armed security officer and another motorcycle officer nearby. Neither was able to stop the killing. The NRA needs to do better than today's stupid proposal. Perhaps if all were to begin to realize that in all but actual combat, guns offer a cowardly response, not courageous in the least, we would begin to make progress. Yesterday, I went to Nations Hardwoods to pick up 8/4 stock for making a headboard for our guest bedroom. So I'm taking a bit of time away from box making and am furniture crafting once more. My wife wants a simple design, completely flush on the front side, but when one is working with real wood, even the most simple of designs requires some complexity. 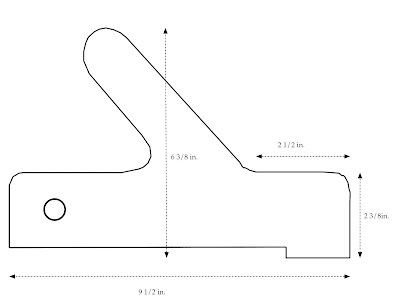 For example, the 22 in. wide floating panel at the back... Real wood expands and contracts throughout its life, as it responds to seasonal changes in humidity. So allowing for that expansion and contraction to take place without placing stress on joints is an essential design consideration. 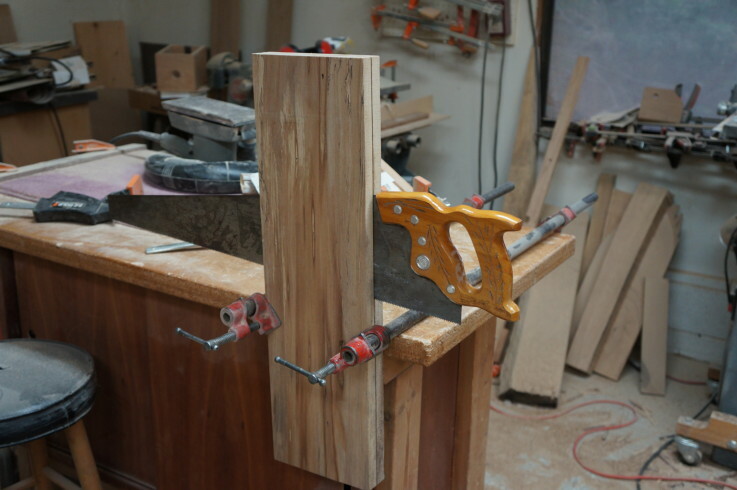 I had planned to miter the top rail to the sides, but asked for a change of plans to allow me to treat each component as an individual piece of wood, but also to eliminate the challenge of cutting large, thick miters on the table saw on large pieces of stock. It is challenge enough with heavy stock to make accurate 90 degree cuts. Nations Hardwoods (sorry, you won't find it on the internet) is my favorite place to buy hardwoods. It is the only place I can find many of the various species of Arkansas hardwoods I use in making inlay for my small boxes, and it is THE place I go when looking for a special piece of wood. For example, yesterday, I found a piece of figured sugar maple, 15 1/4 in. wide, 2 inches thick, and 8 feet long. It would make a beautiful bench or hall table, or the most exquisite planing bench a craftsman might imagine. I bought it for $100.00 as it was the piece of wood I couldn't resist. Anomie according to sociologists and psychologists is a state of "normlessness." "It describes the breakdown of social bonds between an individual and their community, if under unruly scenarios possibly resulting in fragmentation of social identity and rejection of self-regulatory values." If you give a moment to think of the tragic shooting at Newtown, CT this week, the term anomie describes the state of mind enabling that form of horror to visit us again and again. It seems that between anomie and the easy acquisition of dangerous weapons, we're screwed. Burying children due to gun violence will be a thing we watch over and over again. Wood is an antidote to anomie. It connects you with nature. Moving one's hand across its polished surface brings something that may have been lacking even moments before. It soothes. Crafting something from wood informs a person of his or her own creative capacity and control. Making something to share with someone else is one of the cornerstones of human culture. Today I awakened to gently falling snow. Unlike our neighbors to the north, we won't get quite enough of it. But to work in a wood shop warmed with a wood stove burning cut-offs and scraps, also by the motions of my own body and the warmth of my emotions as I go through the process of making a an object of useful beauty is a thing that one must experience in order to truly understand. finished and ready for delivery! My 500 boxes are finished and ready for delivery, and since they are for a corporate gifts customer, I'll not say more until they've been received as gifts. This has been a great commission and one that I am pleased to have received, and as it is interesting, I'll tell more later on in the blog. 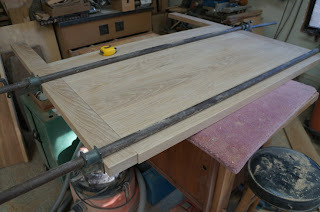 Today I am beginning work on an oak headboard for our guest room. It is a very simple design, intended to be quick and easy to make and to not compete visually with other pieces in the room. 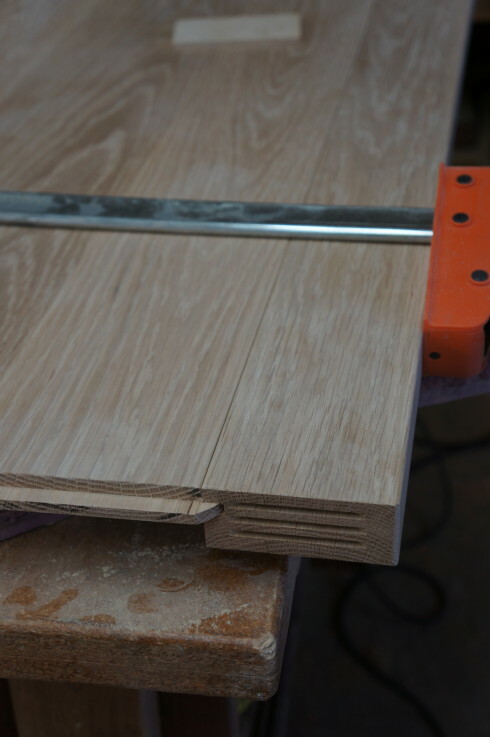 The first step is to plane the material to be glued up, then to join boards into wider sections, that will be once again passed through the planer and glued again to form the large floating panel forming the back. A frame of thicker white oak cut from 8/4 stock will form the frame. For some reason, we know longer seem to understand craftsmanship and the traits of character it instills. For those concerned as I am, about our having created a culture of violence, the following quote from Comenius (1592-1670) will remind us of the value of arts and crafts in the establishment of successful human culture. "We give form to ourselves and to our materials at the same time." There can be no growth toward successful human culture without attention to the growth of the individual, and there is no better way to support that growth than through nurturing craftsmanship. Men armed with hand planes do not kill children. This morning I'm fixing a few things I'd screwed up. No craftsman ever has escaped the opportunity for error and mistake. 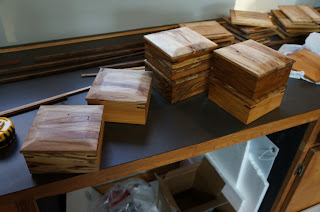 I've been trying to finish the order for 500 boxes and while I was matching and fitting lids, I routed the edges of some too deep from the edge, making them a sloppy fit... My choices were to make new boxes, make new lids, or let my sloppy work slide. But when you've made something in real life, the work speaks loudly for itself. There is inescapable truth in it. I chose to remake lids, and then had them laser engraved with the required logo on the underside, and now am waiting for the finish to dry just a bit before rubbing it out. It was a relatively easy fix, but it required admitting to a fellow craftsman that I'd messed up. The laser engraver asked how I had screwed up, so I fessed up. What craftsman in the whole wide world has never made a mistake? Woodworkers make lots of them, so regardless of how good you get, there's room for humility and fessing up. I was wrong, I made a mistake. "Michael Crichton makes an interesting argument about technology in his thriller "Jurassic Park." He points out that power without discipline is making this society into a wreckage. By the time someone who studies the martial arts becomes a master---literally able to kill with bare hands---that person has also undergone years of training and discipline. But any fool can pick up a gun and kill with it. "A well-regulated militia" surely implies both long training and long discipline. That is the least, the very least, that should be required of those who are permitted to have guns, because a gun is literally the power to kill. "For years, I used to enjoy taunting my gun-nut friends about their psycho-sexual hang-ups---always in a spirit of good cheer, you understand. But letting the noisy minority in the National Rifle Association force us to allow this carnage to continue is just plain insane." There was certainly nothing "well-regulated" in the Newtown shooter's access to guns. In the meantime, in the press, we will witness the witless. Gun toting, NRA proponents from the Senate refused to go on Sunday talk shows, hoping for just a bit of time to cover their butts and get their stories straight. These are folks, who unlike craftsmen, cannot admit they've made big mistakes. In my case, remaking a few lids, took but a few hours. In the case of gun legislation or the lack of it, and their refusal to act, there are 30,000 gun deaths every year. It is a national tragedy, and a national shame. I realize that most have not come here to read my ideas on this. I hate stupidity and arrogance, and I believe working with wood gives a person insight into a reality, perhaps unobserved by those who contend with rhetoric alone. Woodworking requires intelligence, attention, and is the arch enemy of arrogance. About the time you get cocky, you inevitably make mistakes that you fix or that will be there for all to see. With regards to gun legislation, the mistake our politicians and courts have made is there for all to see. We should demand that the laws be fixed. We have suffered too many tragic consequences already. I know that I have readers who are on the other side of this issue. To them, I offer this challenge: Tell me what you say to the parents of children from Sandy Hook School to explain your position. Then tell me what you will actually do to make certain nothing like that ever happens again. "God help me"... the teacher's prayer. Do you think there has ever been a teacher who when standing at the front of class with too many students and too few resources, hasn't asked for help from God? Former Arkansas governor Mike Huckabee (R) weighed in on the massacre at an elementary school in Newtown, Conn. on Friday, saying the crime was no surprise because we have "systematically removed God" from public schools. "We ask why there is violence in our schools, but we have systematically removed God from our schools," Huckabee said on Fox News. "Should we be so surprised that schools would become a place of carnage?" And so Huckabee should have kept his mouth shut. What has been removed from too many schools is not God the creator, but creativity, displaced by standardized testing. When Huckabee, a Baptist Minister, had been governor of Arkansas, he had been a proponent of the arts in school. He acknowledged that he had only stayed in school because of his love of music. It wasn't God that saved Huckabee in his education, but the guitar. Children, much more than needing someone preaching at them and haranguing them with prayer, the Bible, and Ten Commandments need to participate in creative acts, thus becoming acquainted with their own creative rather than destructive inclinations. At the heart of this matter is how making makes one feel about oneself. Those with the power to create have a stronger connection with others, a stronger sense of history and purpose, within their communities. To be a creator is to identify with the creator and to have a sense of one's purpose within the vast scheme of things. Children ages 5 to 14 in America are 13 times as likely to be murdered with guns as children in other industrialized countries... So let’s treat firearms rationally as the center of a public health crisis that claims one life every 20 minutes. The United States realistically isn’t going to ban guns, but we can take steps to reduce the carnage. ... The Occupational Safety and Health Administration has five pages of regulations about ladders, while federal authorities shrug at serious curbs on firearms. Ladders kill around 300 Americans a year, and guns 30,000. Years ago Felix Adler, professor of Columbia University and founder of the Workingman's School in New York City, told about the moral implications of craftsmanship. Those of weak will and with failings of moral character would find redemption in society, and strength of purpose within self, through training in the wood shop. The poor, and those lacking in moral fiber were not the only ones Adler saw as finding great benefit through creative acts and even the children of the rich would benefit in character and moral fiber by working with their hands. So now, instead, we feed our young an unrestricted diet of digital destruction, and then wonder why tragic events like that at Newtown would occur. Can it be that our schools are failing our children? Or that parents failing to see the redemptive value of craftsmanship, would neglect to engage their own children in creative acts? It is the old dilemma of swords vs. plowshares in a nutshell. In the Hindu religion Shiva represented both our creative and destructive inclinations and recognized the fine line between the two. Those who do not find themselves aligned with human creative inclinations, may choose darker means through which to discover self. On another subject, British Woodworking published an article based on the paper I presented to the Crafticulation Conference in Helsinki in Sept. 2008. 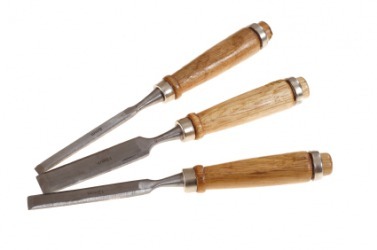 The Article, called "Wisdom of the Hands," describes the making of tools for educational purposes in the Clear Spring School woodshop. I have asked for a link and will provide it when I am able. Today in my wood shop, I'm going through all the 500 boxes, adjusting fit of lids, matching lids to bodies of boxes, and wrapping them for delivery on Wednesday. This is not such a good day for folks interested in woodworking. Newtown, CT, the home of Fine Woodworking Magazine and Taunton Press, was the site of a tragic elementary school shooting in which 28 were killed including 20 kids between the ages of 5 and 11. Some folks have already noticed that people with guns kill people. Another thing I've observed is that folks with mental imbalances are often drawn by their own fantasies toward engagement with guns. A third thing is that schools often become the target of violence. Of the 62 mass shooting in the US in recent years, 16, over 25% have taken place in schools. Is there some reason that in twisted minds, schools would represent such cause for resentment and violence? The conservatives will tell us that guns and violence are unrelated and that the right to own guns is sacred to American society, so sacred in fact that we should not use tragic events like that today as an excuse to talk about solving the problems of gun violence. If one were to choose which is more sacred, the lives of children or the right to unrestricted acquisition of guns, I would choose kids. And while some blog readers would tell me right off the bat that they disagree, there is no time like the present, with two gun tragedies in a single week, for some serious discussion of gun violence to take place. This tragedy hits too close to home for me to ignore. I have friends in Newtown associated with Fine Woodworking and the publisher of my books. At this point it appears that although some Taunton/Fine Woodworking employees have family at that school, all are safe. But who can live in such a small community and be untouched by these horrid events? When I went out this afternoon to pick up some supplies, I found the shop keeper glued to the television as events unfolded at Newtown. He said, "If only teachers were allowed to carry firearms, one of them could have fired back." Is that the kind of nation and education we would prefer for our kids? Folks who live disconnected lives may believe that the hands and brain are separate, and that the hand that holds the gun is in some way set apart from the violence that may result from it's use. We do, on the other hand, have the opportunity to discover our human capacity to create, and that happens when young and we are given the opportunity to make... And I have this theory that children invited to discover their creative side, will not take part in the kinds of tragic destructive acts we witnessed today. 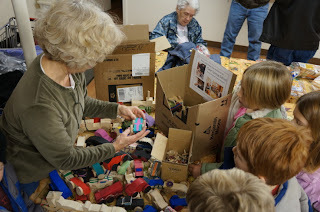 We've been making toys to give to the Flint Street Food Bank, an annual giving project at Clear Spring School. Our children are generous with their skills, and it makes things more meaningful when we make the delivery. Today at the food bank, folks were gathered for a food distribution. Still, the director took time to examine and appreciate each one, and the children enjoyed that special attention. Last week as the kids were at work, they imagined themselves to be elves at work in Santa's work shop. And that has often been the way I've felt at work in my own shop during the holiday season, this year, making 500 boxes during the month of December. It started as a cardinal. This was our last wood shop day before the Christmas holiday. In case you've not been counting, there are still about 12 making days before Christmas eve. Sir Ken Robinson, in this Ted Talk, pleads the case for personalized learning. He says that we have a fast food model for our children's educations, but that we need to tread softly, for their dreams are spread at our feet. Want to know how to truly personalize learning? 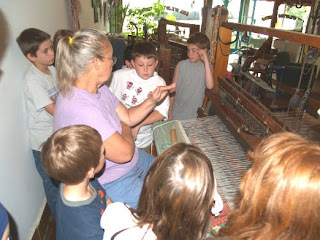 Engage the hands, put children "in touch " with learning. Can you see the continuing dilemma? We know only what we know, and educate our children as though we do know what we do not, but the real meaning of education is not to put something in, but to draw something forth and to encourage children to meet and master a future which is unknown to us. A large part of the educational waste comes from the attempt to build a superstructure of knowledge without a solid foundation in the child's relation to his social environment. In the language of correlation it i s not science, or history, or geography that is the center, but the group of social activities growing out of the home relations. It is beginning with the motor rather than with the sensory side... It is one of the great mistakes of education to make reading and writing constitute the bulk of the school work the first two years. The true way is to teach them incidentally as the outgrowth of the social activities at this time. "all teachers needed to be taught the arts and crafts, industries and occupations, that were serviceable in the home, school, and play environments of children. The teacher-training curriculum, therefore, was not organized to produce special teachers of manual-arts subjects. In training the teachers, however, special teachers were employed to teach construction in wood and metals, textiles and paper; also drawing and modeling, and art and design applied in a great variety of materials. In all of these, the ideal was to emphasize natural correlations with science, history, geography, and literature." 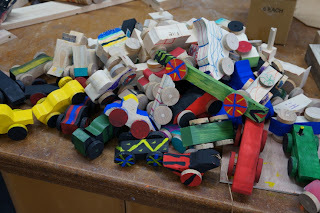 When I was in Finland, I had the pleasure of visiting the university of Helsinki wood shop where Kindergarten teachers, getting their master's degrees in education were learning to work with wood. How stupid American education has become in contrast to that. In my own wood shop today, and as our nation seems to be returning to an understanding that our citizenry is at its best when creating objects of useful beauty, I'll be applying one more coat of Danish oil to the lids of boxes. I'll also spend time getting the school wood shop clean and ready for class on Monday. 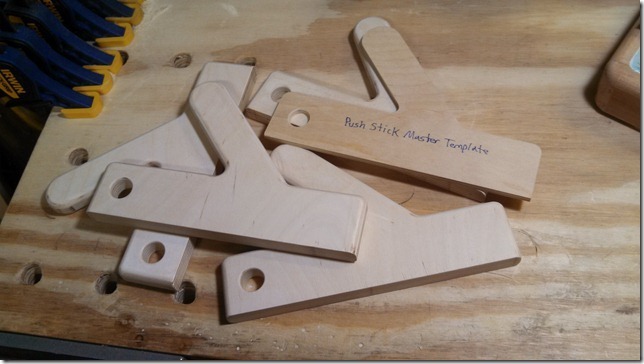 Yesterday, I posted a design for my usual pushstick here on the blog and sent the design to the reader who had made the request. John got right to work as you can see in the image at left. Nicely done. 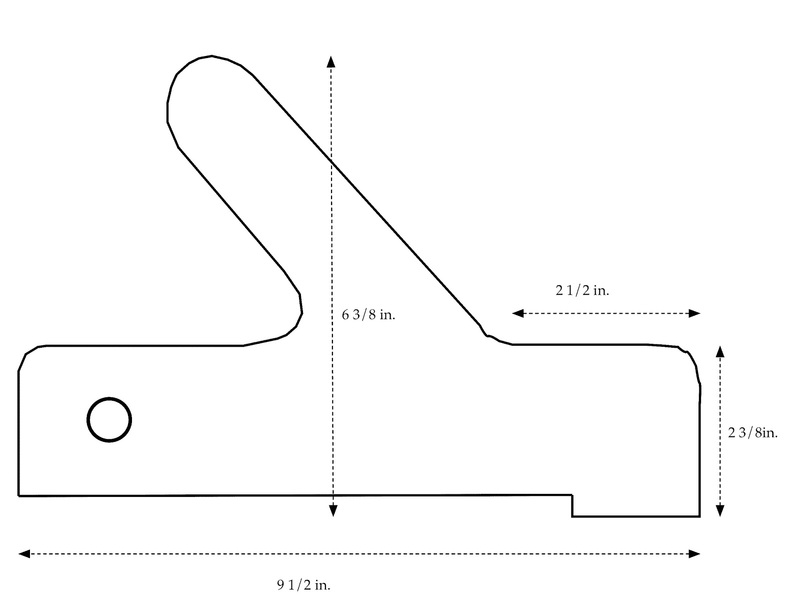 When I teach, students want to make a tracing of the push stick that I use. In addition a reader noted my use of it in one of my DVDs and asked for the design. I had seen a pushstick of similar design, made one and found it useful as the placement of the handle allowed me to apply downward force to the front end of the stock. It also keeps the hands well clear of the cut. Here is the design, so you can make one yourself. 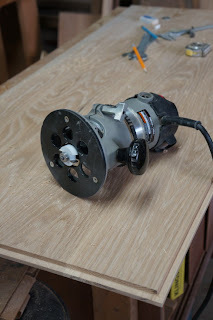 I prefer to make these from good quality plywood, and rout the edges smooth with a 1/4 in. roundover bit. You can help Clear Spring School get a new school bus to help with off-campus learning experiences. Vote Here, once each day for the next 10 days. We are a very small school competing against much larger schools with many more folks to vote, and yet our educational mission is important to all and to the future of American education. The bus takes our kids off campus for greater learning. Clear Spring School needs a new school bus, and we have applied to a foundation that will help if we get enough votes. You can vote here, once a day if you like. To resaw, cut on both sides and finish with hand saw. 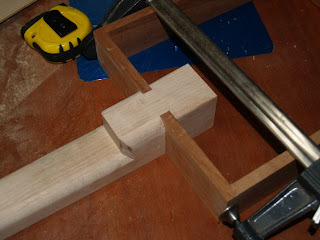 Make miter cuts to form the box sides. Tape the box together to check the fit. Add a bottom and glue up. Tape and rubber bands hold as the glue sets. Sand and apply Danish oil finish. 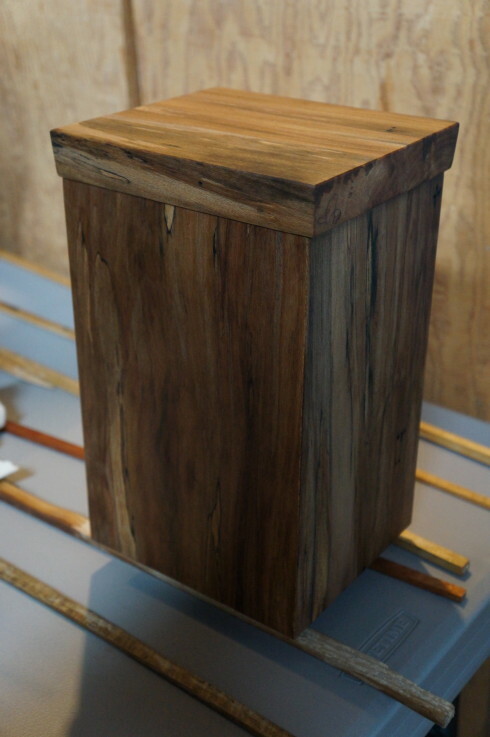 A friend suggested that I'm parsimonious, but I was told it was a good thing... that I reduce things to simple steps, the bare necessities to make boxes that are beautiful, useful and that last. 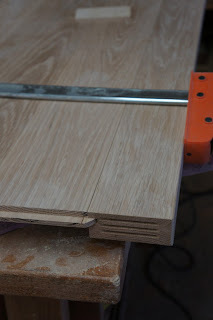 In this case, the mitered corners are along the long grain, the most effective way to glue wood. 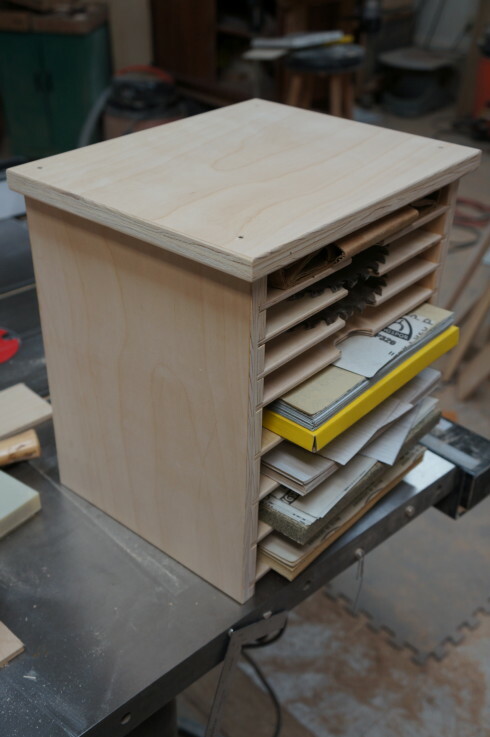 So no screws, nails, keys, finger joints, dovetails, or other mechanical means are required to make a lasting box. While my helper is sanding and applying finish to lids of boxes, I plan to begin making a box for crematory remains of a friend who died much too young. I will show a few step by step photos later in the day. I also will visit with a writer who is working on two articles about the Wisdom of the Hands program and my work for two publications. As you can probably guess, I have no trouble talking about my favorite subject, the hands, and how they enable learning and release pent-up enthusiasm. Watch when you see someone get excited talking about something they really want to do. You will see the hands flailing in expression of their unbridled enthusiasm. On another subject, I received a book in the mail published by Woodcraft Magazine. 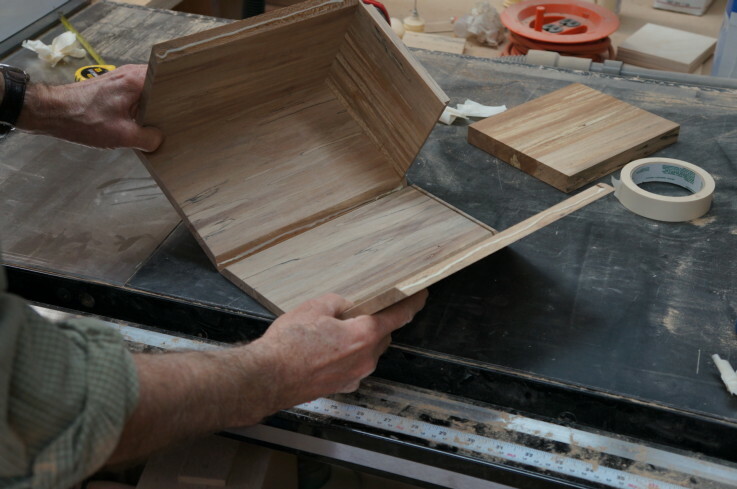 It includes 14 Wooden Boxes You Can Make and two bonus chapters, one of which I had written for the magazine last year on Mixing and Matching Woods. If you had missed that article, you can find it and some excellent box making projects in this book. Yesterday a very successful Silver Tea was held at the Crescent Hotel in Eureka Springs to benefit the Eureka Springs School of the Arts. I had the honor of pouring coffee and tea for guests, as you can see in the photo above. 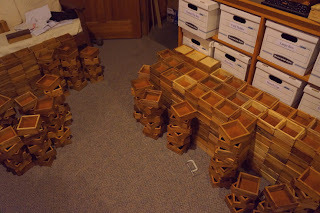 I am up to my ears in boxes, and am currently applying Danish oil to lids. Hundreds of them. Each has to be fully dry before being packed away to await a second application, so I can reasonably do batches of about 100-130 in the course of a day. Today is the St. James Episcopal Church's annual fundraiser, The Silver Tea, and as a board member of the Eureka Springs School of the Arts, I'll be dressing in suit and tie and serving tea. This year, the Silver Tea benefits ESSA, our nationally known school of the arts. I know readers may have some curiosity about the box guitars we are making at Clear Spring School. I am now calling them "box guitars" rather than cigar box guitars because we've not used cigar boxes, but instead made boxes ourselves, using locked corners. 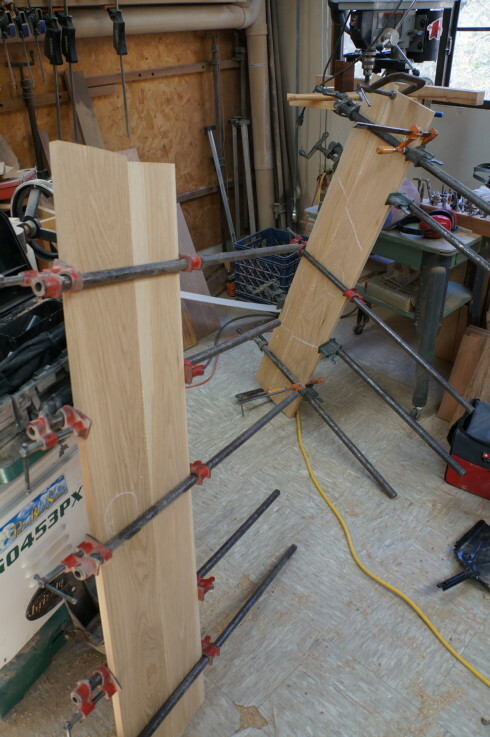 The photo above shows the way we are attaching the necks to be certain of a firm connection. 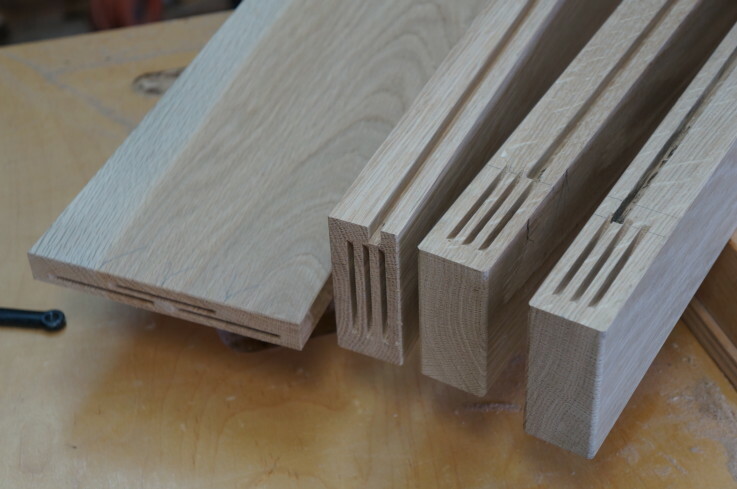 The sides of the box fit into dados cut on the sides of the neck assembly, allowing the top, bottom and sides to provide strength, but also allowing the top and bottom to resonate. Next the top will be glued on and internal bracing will be added under the bridge. I don't think I could have a project in which my high school students could take greater interest. As you can see, I'm also learning a few things, which makes wood shop the best of both worlds, for both teacher and students. On Tuesday, our high school students visited the Ralph Foster Museum at the University of the Ozarks as they were making a college visit. The samples of wood shown are only a small portion of the diverse local species one can discover through woodworking. Thanks, Jessica, for the photo. Our high school students were queried as to what things stand out so far during this school year, and of course, the things that they mention are not the things that they have learned, but rather, the things that they've done. What doing does is anchor learning in personal feelings, sequence of events and personal growth. When what one does and what one learns are in sync, relevance is clear. What students learn may soon be forgotten as it loses relevance or had been lacking relevance in the first place. What students have done lingers as it builds confidence for lifelong learning. It seems to be a characteristic of the symbolic animal to make use of one part of its body to perform many different functions. The hand is an example. The hand pulls from the earth the root and the herb, gathers fruit from the tree, peels it and takes it to its mouth. The hand catches the object, moves it, brings it into the body, throws it away. The hand pulls and pushes, gathers and scatters, squeezes and relaxes, contracts and distends, rolls up and unrolls; tightens and loosens, clears (as in clearing brush for planting), palpates, caresses, pinches, claws, squeezes, slaps, pummels; afterwards, massages the sore muscle. 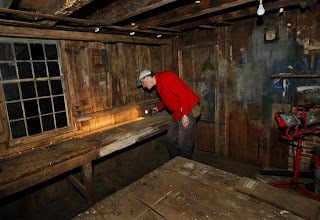 The hand feels with the fingertips, palpates and presses with the flesh, scrapes, scratches, rakes (interestingly, in carpentry – the verb escarvar means “scarfs” – creates a joint to unite two pieces of lumber in one continuous piece) scarifies, picks with the fingernails. With the knuckles, it hits. The hand opens the wound and dresses it. Ruffles the hair (or fur, animal’s coat) and smoothes it. Braids and unbraids the hair. Wrinkles and unwrinkles the paper and the cloth. Anoints and conjures, sprinkles (like baptizing?) and exorcises. It accuses with the index, applauds with the palms, protects with the cupped hands (literally the “shell”). Allows life with a thumbs-up; and with thumbs-down, orders death. Measures length with the span of the hand (palmo) and weight with the palm (palma). Signals with gestures the I, you, him, here, there, over there, today, yesterday, tomorrow, little, a lot, more or less, one, two, three, numbers up to ten and its multiples and fractions. No, never, nothing. It is the voice of the mute, the voice of the deaf, and the reading of the blind. It directs the voice to rise, quiets the hubbub, imposes silence. Greets the friend, waving lightly beside the head, and in the same setting, stretches out the arm and says good-bye. Urges on, and orders a stop. Brings a child into the world and strangles the enemy. Soaps clothing, scrubs, wrings, rinses, lays it out in the sun, gathers it from the line, smoothes the wrinkles, folds and puts it away. The hand prepares the food. Grinds grain, peels the vegetable, picks the greens, scales fish, plucks the bird and bones it. It cleans. It squeezes to extract the juice. Pounds with clenched fist, cuts to size, mixes, kneads, flattens, rolls up, smoothes out, oils, covers up, flours, wraps, shapes, pulls apart, flours, garnishes, embellishes and serves. The hand throws the ball and catches, parries and strikes. Lifts it and lets it fall. The hand makes sound; beats on the leg and on the chest, marks the beat, strikes the drum and the tambourine, beats, snaps the castanets, plucks the strings of the harp and the guitar, fingers the keys of the harpsichord and the piano, grasps the bow of the violin and the cello, holds woodwinds and brass. The fingers close and open the path of the breath that comes out through the holes of the flute, the clarinet and the oboe. The hand directs the orchestra. The hand, carrier of the sacred. Hands clasped pray, palm against palm or with laced fingers. With the hand, the faithful makes the sign of the cross. The hand, giver of the sacred. The hand mixes the salt and the water for baptism, and anoints the new Christian; the hand anoints with oil at confirmation, while the godfather’s right hand rests on the godson’s shoulder; the betrothed extend their hands to celebrate the sacrament of love and give each other rings to receive the ring of the alliance; the hand absolves the penitent from sin; the hands serve the eucharist bread to the communicants, hands consecrate the new priest; hands bring extreme unction to the dying one; and to the dead, the blessing and the prayer of peace. In manus tuas, Domine, commendo spiritum meum. To perform so many actions, it takes only a small but flexible part of the anatomy; eight little bones in the wrist, five metacarpals, and the fingers with the lower, middle and fingertip phalanxes. We could never describe all that the hand can do when it is extended and empowered by the tools that human ingenuity has invented in its contradance of needs and desires.
. . . In the Machine Age, has the hand perhaps lost its finest articulations with which it fitted the protuberances and recesses of the material? The workmanship, thus of necessity, diminishes or declines, and hands operate the assembly lines far away from their products. They push buttons, turn handles, connect and disconnect keys, pull and push levers, control panels, ceding to the machine tasks that they used to do. The machine, docile, and therefore violent, does exactly what the hands tell it to do, but if the operator’s muscle flinches, it also knows how to continue, demanding constant vigilance; if not, it cuts off inattentive fingers. There were 8 million work accidents in Brazil alone in 1975. Massive Open Online Course, or MOOC seems to be the direction of upper level college education, and wise educators seem to have arrived at the conclusion that lecture based learning, even at the college level is nearly a waste of time. In any case, what self-respecting professor would want to stand talking at the head of the class while his students surreptitiously check their facebook accounts? Believe it or not, that's the direction things have been going... parents investing billions as their children keep passively entertained. Students learn by doing, and "flipping classrooms" is becoming more common. 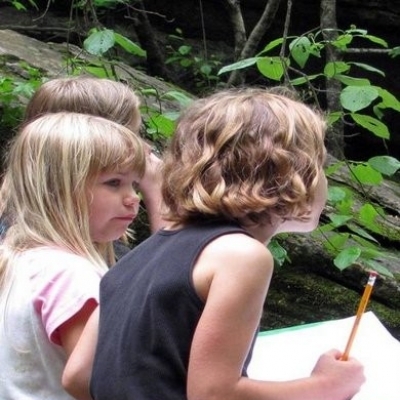 In a flipped classroom students spend school time doing things that utilize outside the classroom learning. That means collaborating with others on projects, making things and doing real research that demonstrate learning, etc. Either classrooms flip, making education meaningful and relevant, or students will at some point simply forget standard universities and forgo the associated expense, and opt for the free learning presented by MOOC if they in some way find it relevant to them. Today in the CSS wood shop, first, second and third grade students made wooden toys, and the 7th, 8th and 9th grade students turned legs on the lathe and made and painted toy cars. What you see in the photo at left is 450 boxes of the current set of 500. The last 50 (not shown) are being finished with Danish oil while the lids are being laser engraved, receiving their final sanding and finish. I wondered when I accepted this commission where I would be able to put things. Fortunately, that's not as big a problem as I imagined. Delivery will take place in less than two weeks. 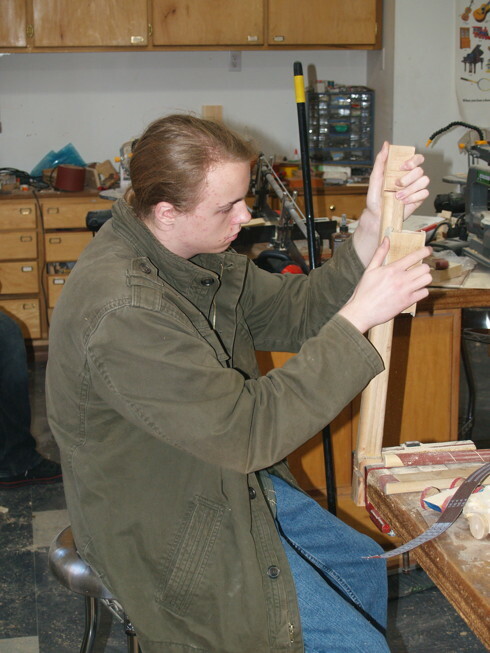 Today in the CSS woodshop, the high school students began sanding their guitar necks. An 18th century wood shop was discovered at a private pre-school for in Doxbury, Massachusetts. It is certainly a reminder of more simple days of craftsmanship. 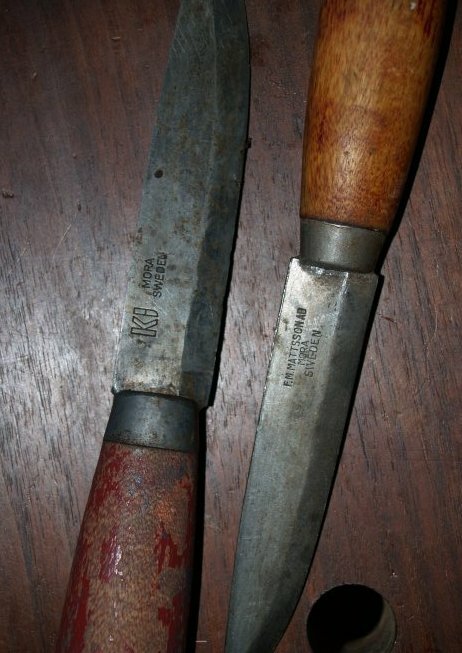 One can only wish that tools and shavings were still in place. This series of photographs, however, can help stir the imagination. My thanks to JD for the links. Yesterday my wife asked my ideas of life, death, life after death, reincarnation and the like... notions that I would normally reserve for my Sawzen blog which usually languishes unattended, as most of my writing time is invested here. One can almost feel the presence of an earlier craftsman in the Roxbury shop. Can it be that the man who spent glorious hours creatively engaged there is actually dead? Or does the best part of him live in our own hands and attentions and through our own creative acts? There is a silliness in thinking we are separate individuals in the first place. And if we can get over that silliness, can we not see that the comings and goings of individual bodies is of less significance than our fears might imply? And if we were to arrive at a place beyond that silliness, from which we might witness the depth and breadth of our connections with others, could we not determine it to be wise to give more to others, that our own attentions might be more fully invested in that which lives on uninterrupted by death? If you make something beautiful and lasting, or share with others the ability to do so, and then your own body meets the moment of actual dissolution and distribution, are you dead, or is the best part of you extended as essence in all that you've touched? Today at the Clear Spring School students in 4th, 5th and 6th grades will be making toys for the food bank and the high school students will be making cigar box guitars. I have been doing a review of education reform books, and of books giving some emphasis to hands-on learning. There is method to my madness in that I'm trying to clarify and refine a proposal for my own book about education reform based on a hand-centric view. To my knowledge there is no widespread clear theoretical explanation of what the hands actually do to make learning more real, more intense and more effective, and yet it is a given that "hands-on" learning implies something deeper and richer than the purely academic. And so what is it about the hands? I often think of these questions very late at night, and the answers have greater clarity then that in the light of day when other matters become pressing. By bringing the hands into direct engagement in learning we make learning real, and demanding of interest and attention. The second part is that the hands enable physical response to learning, thus the learner is not a mere captive of the system but rather one granted agency. Taking direct action in response to learning is one of the most important character traits of our humanity.Without agency, even the most resilient are reduced to the point of depression. Sir Phillip Magnus, writing as director of the City and Guilds of the London Institute, wrote about the need for all children to have training in the wood shop. "It cannot be too often repeated that the object of workshop practice, as a part of general education, is not to teach a boy a trade, but to develop his faculties and to give him manual skill; that, although the carpenter's bench the turner's lathe are employed as instrument of such training, the object of the instruction is not to create carpenters or joiners, but to familiarize the pupil with the properties of such common substances as wood and iron, to teach the hand and eye to work in unison, to accustom the pupil to exact measurements, and to enable him by the use of tools to produce actual things from drawings that represent them." According to Charles A. Bennett's History of Manual and Industrial Education Sir Phillip Magnus offered proof that "a child's literary education would not suffer by devoting a part of the regular school time to manual instruction." 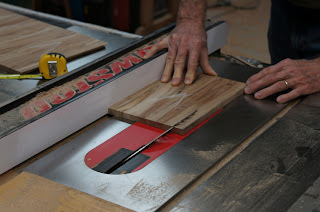 One of the important things one gets when woodworking is well taught, is a sense of connection between the development of human culture as it intersects the natural world. Another is the sense of one's own value as a craftsman and maker of beautiful and useful things. A third thing is the development of intellect, and a fourth thing, the ability to conceptualize and then bring one's own concepts into fruition. Instead, we've created schools in which students are taught passivity and to believe without testing data and material in their own hands... We may keep them safely entertained and distracted, but is that what schooling should be about? 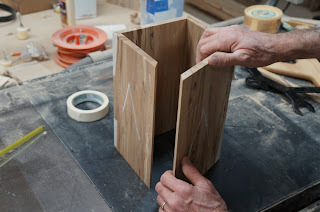 Today in my own wood shop, I'm sanding the lids of boxes, preparing the second set to be laser engraved.